This summer we decided we would feature things that are near us to show the fun our own state offers. I wanted to start with a really fun festival- Nebraskaland Days in North Platte, NE. This event is about 10 days long and takes place in June. During it you can catch concerts, a parade, art shows, carriage driving contests and so much more family fun and even some adult fun. This entry was posted in family fun, Road Trip, Tuesday Good Eatin on July 9, 2015 by Kandi. Every Tuesday join in and add your favorite recipe. If you would like to post the hop on your blog…comment below and we will gladly send you the html. This entry was posted in Recipes, Tuesday Good Eatin on June 10, 2014 by Kandi. No Giveaways Please…all giveaways will be removed. This entry was posted in cooking, Recipes, The Pitch List, Tuesday Good Eatin on February 18, 2014 by Kandi. This week I am sharing my Strawberry Muffins! This recipe was something out of a really cute cookbook that my daughter received, A Strawberry Shortcake Cookbook. She had so much fun helping me make these and they tasted so good I thought I would share! Be sure to also check out the other great recipes and feel free to add yours! This entry was posted in Recipes, The Pitch List, Tuesday Good Eatin on February 10, 2014 by Kandi. Tuesday’s Good Eatin’ Hop ft GF Drop Biscuits! This week I am adding my GF Drop Biscuits! These were so simple to make and they didn’t turn out dry at all! You can view the recipe by clicking HERE! When you are done checking that out be sure to visit some of the other great recipes below! Feel free to add your recipe! This entry was posted in cooking, Recipes, The Pitch List, Tuesday Good Eatin on February 4, 2014 by Kandi. Tuesday Good Eatin’ #Recipes for Jan 21st! This weekend I am joining in with sharing my Chicken Parmesan. I am doing something personal where each week I create a new dish and share it with you. I will be promoting it on here as well. Chicken Parmesan was my dish for last week so be sure to check it out and the other great recipes below! This entry was posted in cooking, Recipes, The Pitch List, Tuesday Good Eatin on January 21, 2014 by Kandi. Old Time Favorite with a Twist! Growing up I was always looking forward to this time of year. My Grandma KC would always bake for us. And I mean breads cookies and more! We loved this time of year! But once I got married I wanted to start learning those recipes so I can keep them going years to come. My Grandma’s pumpkin bread was the first I learned. I love this bread, and I am not a big pumpkin person. First- These little Hillshire Farm lunch meat containers holds exactly 2 cups of fresh pumpkin which makes freezing so much easier! The other things I have learned is if you use fresh pumpkin it tastes so much better then canned. Also freshly ground nutmeg adds more flavor. Now this tastes great as is. It is nice and moist and this is not a gluten free recipe. However, you can convert it to gluten free. Just use a gluten free all purpose flour blend such as the Betty Crocker Rice Blend or Glutino’s All purpose flour blend. It will still turn out moist and hold together nicely even with the gluten free flour! This last time I made it I was feeling creative and wanted to change things up. So I made a delicious glaze to go over it. First mix the brown sugar with corn syrup and 2 tbsp milk until the brown sugar is dissolved and creamy. Add the confectioners sugar and mix well. Add additional 1-2 tbsp of milk until the glaze is the consistency you want. Drizzle over the bread/muffin and let harden then enjoy! I hope you guys enjoy this recipe as much as I have grown to love it. Be sure to check out Good Cook’s Facebook page for more great Recipes! Come Join Me, Good Cook, TheFrugalMom and other Good Cook Kitchen Experts! Join in as we talk about everything Thanksgiving from turkey prep to decorating the table. Plus get a chance to win a special gift and one of three $200 Thanksgiving Baskets that will arrive in time for your dinner. This entry was posted in cooking, Good Cook, Recipes, Tuesday Good Eatin on November 19, 2013 by Kandi. 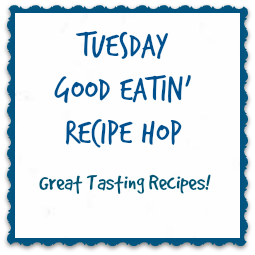 Tuesday’s Good Eatin’ Recipe Hop! It has been awhile since I have shared this list! There are always some great recipes on here so browse around and enjoy! This entry was posted in cooking, Recipes, The Pitch List, Tuesday Good Eatin on June 26, 2013 by Kandi. This week I am sharing my Chicken Cordon Bleu recipe! I love this dish and my kids asked for more so it was a hit with them as well! Don’t forget to check out these other great recipes and feel free to add your own! This entry was posted in Recipes, The Pitch List, Tuesday Good Eatin on March 12, 2013 by Kandi. This entry was posted in Chicken, cooking, Recipes, Slightly Indulgent Tuesday, Tuesday Good Eatin on March 12, 2013 by Kandi.